After Pioneer spoiling Suncoast with all the SMS features, even when pre-orders for other stores had yet to be filled, on March 2nd, I finally got my Sailor Moon S: Heart Collection I DVD. Opening the box from amazon.com and taking off the plastic covering, I checked out the case. This is possibly the BEST casing for a DVD I've ever seen. Sure, the only anime DVDs I have are the Neon Gensis Evangelion series and Princess Mononoke, but even browsing in stores through their anime DVD collection (if I manage to find one), I could tell that the SMS casing can't be beat. I'm going to use the scans that Bob did to help explain it. The outer case had a nice front, and a description that had the orginal names and term Sailor Soldiers on the back, keeping all purists happy (you can see the outer cover here). Pioneer was clever in doing the front design. 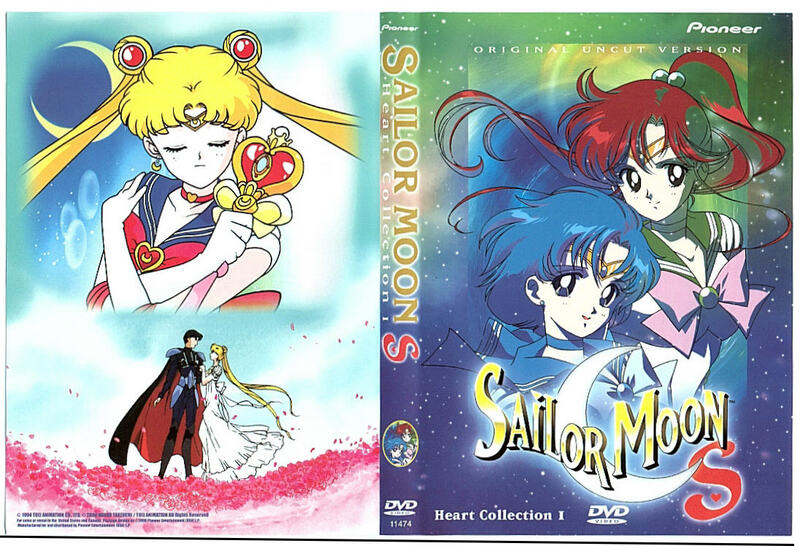 What they did was take a picture of Sailor Moon during her Moon Gorgeous Medition attack from SuperS, and changed her to her Cosmic fuku holding the Spiral Moon Heart Rod rather than the Kaleida-Moon Scope (credit goes to the Sailor Senshi Page for analyzing all the covers Pioneer has made). I wondered what reversible meant when Pioneer stated thats the type of cover, and I expected something to the extent of what ADV did with the NGE DVDs. Since a DVD of NGE equals 2 VHSs (at least for the first 2), they had the cover of the first VHS on the outside and an insert inside with the cover art of the second VHS. Thats about what I expected, but Pioneer made the cover truely reversible, as on the back of the outer cover was the cover of the uncut second volume VHS (almost excatly like the orginal LD Volume 2) and a couple pictures on the other side (click here to see). Whats really cool about this is that the DVD case is clear plastic, so you can see the other cover, which I'll call the inner cover, when you open up the case. You can also flip the cover around if you want the inner cover to be seen on the outside and the outer on the inside. Theres also a little insert in the inside (click here) which is the scene index. 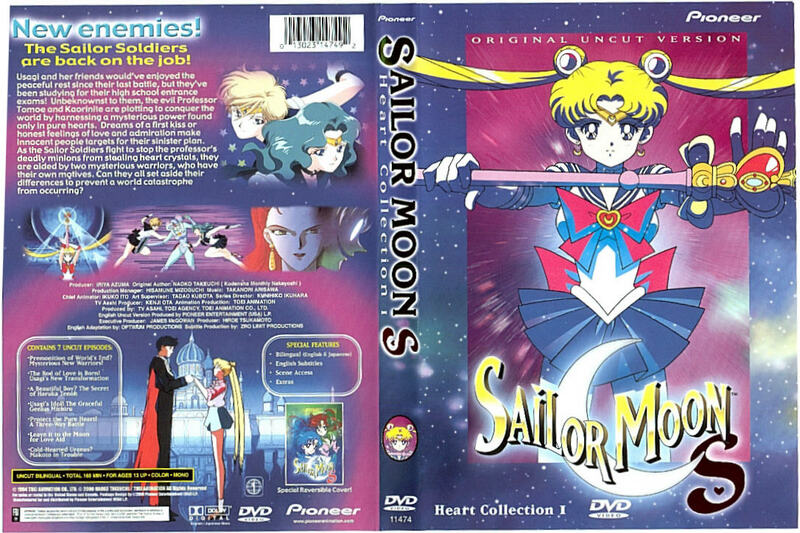 The DVD label is also done well, it's blue and has a pic from Sailor Moon which was used on the inside cover and the title of the DVD on it. Now to finally put it in and start it up. Got the normal FBI stuff, the Pioneer logo, then suddenly Sailor Moon starting to do Moon Spiral Heart Attack, and the clip stopps where the scene normally pauses, and the menu appears. Just the basic menu, we've got thy play button, setup button, scene index, and the extra stuff. Play obviously plays with the settings you have set. The setup menu is probably the least appealing of all the menus, but still looks good. It has the basic subtitles on/off and English/Japanese options. The scene index was done very well. Each episode is broken up into 5 secnes (as seen in the scene index insert), each scene has a heart shaped pic placed well around the screen. The title of the episode is on the top of the screen, and the groups of scenes is on the bottom (each group equals 1 episode, ie episode 1 is 1 - 5, 2 is 6 - 10, and so on). Now to the extra stuff (yes, thats excatly how it was named). First thing is a really extensive profile of Sailor Moon. A two "page" summary, one "page" bio, a small description of her new attack, and pictures of her new brooch. Done very well, I wonder how this feature will work for the rest of the DVDs. The second extra feature was a textless version of the opening video, with a subtitle karoke option. That was done nicely as well, I found out I didn't know the song as well as I thought *sweat drop*, but one thing confised me. They used the third opening which doesn't get used until halfway through the season. More will be explained about that later. The last extra was a DVD credits screen, for the people who worked on the DVD. Time to watch the sub, something most of us haven't seen in a while. I was excited because this would be the first time I could see it on a full screen in good quality since I don't have my fansubs yet and have only watched them through my computer monitor on RealPlayer. So I set up the DVD to play the subtitles and the Japanese audio track. Play. Ah, so great to see the prologue again for each episode, something I've missed dearly. Now the opening, full screen, looks gre..... whats this? Uranus and Neptune aren't darkened? Pluto and Hotaru are in it? This is the third opening sequence, but why is it here? It doesn't get used until about halfway in the season when Sailor Moon gets the Holy Grail, Pluto returns, and Hotaru is introduced. This could explain why the third opening played in the extra feature metioned above, it seems that the third one is the only one on the DVD! For those of you confised about what I mean when I describe the openings, heres the jist of it. They're all basically the same opening, with differences as things in the season go on. The first opening, used in the first two episodes only, have Uranus and Neptuned darkened, so we don't see who they are yet. From the third episode to halfway through the season, you can see Uranus and Neptune clearly because the third episode was the first time we get to see them. Then the third opening is used for the rest of the season, adding Pluto and Hotaru to the mix, along with a small clip of Super Sailor Moon with the Holy Grail. I'm guessing that Toei is the reason for this mistake. For their S memorial LD (memorial LDs sum up the season and have the opening of the season without the kanji avilible to play), they must've only had the third opening on it without the kanji, and sent only that to Pioneer in the US. It makes sense, but it feels weird seeing the wrong opening sequence. Little animation sequence to start the episode, and we've got the eyecatch back! The episode title screen is shown as normal with the English translation above the kanji. The first half plays on, and where the commerical break eye-catch is come up, and it's there! Both of them! Then the second half plays on, and it's time for the credits. After seeing the wrong opening sequence, I didn't know what to expect, either Otome no Policy which is used only in the first two episodes, or Tuxedo Mirage used from the third episode on. I was glad to see that it was Otome no Policy, which gave me a sigh of relief that they didn't screw up anything else. The moment was short lived, as instead of seeing a preview to the next episode, the prologue for the next episode played! They took out the next episode previews! Why? They're only 30 seconds at most and introduce the next episode well. I realize that when CWi dubbed SMS and SMSS last year, they never dubbed them, but why would that effect them not being on the DVD? Moreover, if it did for some reason, why couldn't Pioneer spend a few bucks and dub it themselves if thats the problem? It's 3 in a half minutes total at most, this is just wrong to take them out for any reason. In general, the subtitle translations were great. Everything sounded better and made more sense than the VKLL subs for the most part. The only thing I didn't like with the subs was that the daimons are now called daimohns. The added "h" just seems weird to me. Throught the DVD, I noticed a couple small things that might be points of interest. First off, in the opening video, you see the text of credits and you'll notice that there is text for the opening theme and closing theme songs. I noticed that they swapped between Otome no Policy and Tuxedo Mirage every episode, even though Otome no Policy is only used in the first two. Another small thing I nocied was in the credits. When they translated the kanji into romanji so English audiences could read them, you'll notice the list of seyiuu and the characted they played. In the character side of the list, the order is generally Usagi, Mamoru, the inners, the outers, Tomoe, Kaorinite, the MOTD, and any other character in the episode. An observation I made while watching was with how they had the outers names. For the first two episodes, their lines read "Mysterious Soldier" instead of giving their name, which I liked because it didn't reveal anything like the wrong opener did. 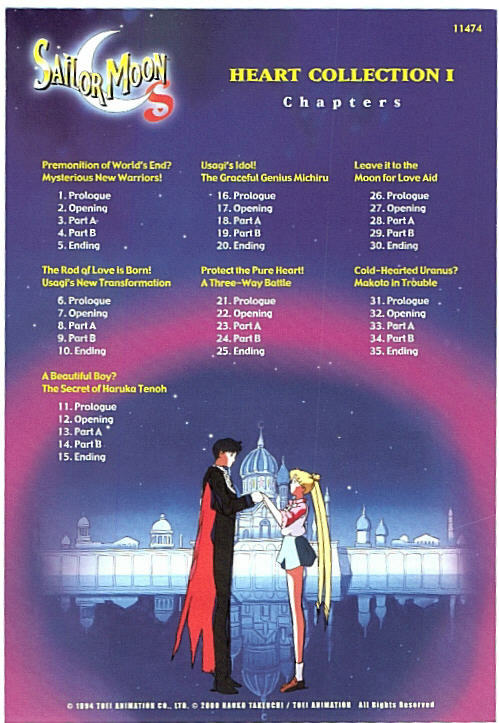 Now, for every episode, Usagi's, Mamoru's, and the inner's names only had their first names listed. However, the outers had both first AND last name listed until the last episode, where they had only their first name like everyone else. Since this is the first time seeing the orginal credits in romanji or even having them availble, I'm not sure if they "broke in" the senshi's last names as time went on in the first two seasons like they just did with the outers or what? So I'm not sure what to think of it, but it is a tad interesting when you think about it. Now for the uncut dub. To put it in as much basic terms as possible, it was just the dub we've all watched on TV with the cut scenes put in and no mirror effects. In other words, take out all the red and green boxes from the comparisons and there you have it. An "uncut" dub with very little work put into it. One side of me isn't that suprised, while the other is, and both have their good reasons for it. The side that isn't suprised didn't really expect Pioneer to actually redub the whole season. It would cost more money basically and take up some time as well. But this is where my other side comes in. You see, between Pioneer announcing SMS and SMSS to come out and the first release of it was about 6 months. It took CWi about 6 months to dub all of SMS and SMSS for TV. CWi dubbed 77 episodes in that short time period. Pioneer only took the first 7 episodes of S, added subtitles to the orginals, and added the english dub track that CWi already made. I think within 6 months, they could've made great improvements on the dub, making it truly uncut. Just adding the scenes cut out and taking out the mirror effects doesn't make it uncut. The dialogue is just as important, if not more. Changing the dialogue changes lots of plot elements of the show. Granted, some things do need to be changed for English audiences, but besides the subtle metions of school years, there really wasn't any cultural clashes. Speaking of the school years thing, I made another interesting observation. In the third episode on the sub, Haruka said she was in 10th grade, Pioneer changed second year high school to that, which is understandable. What I find funny is that on the seventh episode on the dub, Lita asks what year high school Michelle is and she responds first. I think it's a bit funny that the sub tried to reflect the English school system while the dub refelcted the Japanese one. And I still can't help but chuckle when the translated title of the episode appears above the kanji (both sub and dub) in the dub and they go by different names when watching the dub. I like the translated titles, they fit well, except for the last one. They changed what we know as "Makoto in a pinch" or something like that to "Makoto in trouble." My problem with that is when you hear Usagi read the episode title in Japanese, you can hear the word "pinch" rather easily. All in all, this DVD was done very well. I would give it a four out of five. Awesome case, good menu layout, and a well done sub. However the wrong opening, absence of the next episode preview, and how they handled the dub just didn't sit well with me. If this DVD had come out around the time they first gave the date I would understand a bit more, but like I metioned above, they had 6 months to produce a sub and uncut dub for 7 episodes which should've been much better with the time provided. At least when CWi dubbed 11 times that much in the same block of time, mistakes were expected, but Pioneer could've made a near perfect uncut dub had they used the last 6 months wisely. I hope that with the next releases on April 10th that they can at least fix the opening sequence and add the next episode previews. I also hope that they learned about the high demand of the products from this first release to better supply the public than they did almost a month ago. Playing favorites with Suncoast was not a good move as anyone like me who doesn't have one. Within a week, all of Suncoasts pre-orders were filled, from that point Pioneer should have begun to supply other stores so their pre-orders could have been taken care of and make it more fair to everyone. It should not have been three weeks before anyone besides Suncoast even saw the products. Besides playing favorites in the release, the opening sequence, no next episode previews, and being lazy on the uncut dub, Pioneer did an exceptional job with the DVD and I can't wait to get the next ones as they come out.